Windows Troubles Analyzer is a fake security application from the same family as: Windows Processes Organizer, Windows Privacy Agent, Windows Express Settings, Windows Optimal Tool, Windows Safety Guarantee, Windows AV Software, Windows Express Help, Windows User Satellite, Windows Problems Solution, Windows Optimal Settings, Windows Optimal Solution, Windows Care Tool, Windows Wise Protection, Windows Software Guard, Windows Software Protection, Windows Safety Protection, Windows Problems Protector, Windows Problems Remover, Windows Health Center, Windows Shield Center, Windows Antispyware Solution, Windows Risk Eliminator, Windows Universal Tool, Windows Utility Tool, Windows Security & Control, Windows Optimization & Security, Windows System Optimizator, Windows Optimization Center, Privacy Corrector, Privacy Guard 2010. This rogue displays fake warning messages pushing users to buy a license. If your PC is infected with Windows Troubles Analyzer use MBAM to remove the infection. AntiMalware GO is a fake security application (rogue) from the same family as AntiVira Av, Antivirus .NET, Antivirus Scan. It displays fake infections to push users into buying a license. If your PC is infected with AntiMalware GO use MBAM to remove the infection. Windows Processes Organizer is a fake security application from the same family as: Windows Privacy Agent, Windows Express Settings, Windows Optimal Tool, Windows Safety Guarantee, Windows AV Software, Windows Express Help, Windows User Satellite, Windows Problems Solution, Windows Optimal Settings, Windows Optimal Solution, Windows Care Tool, Windows Wise Protection, Windows Software Guard, Windows Software Protection, Windows Safety Protection, Windows Problems Protector, Windows Problems Remover, Windows Health Center, Windows Shield Center, Windows Antispyware Solution, Windows Risk Eliminator, Windows Universal Tool, Windows Utility Tool, Windows Security & Control, Windows Optimization & Security, Windows System Optimizator, Windows Optimization Center, Privacy Corrector, Privacy Guard 2010. This rogue displays fake warning messages pushing users to buy a license. 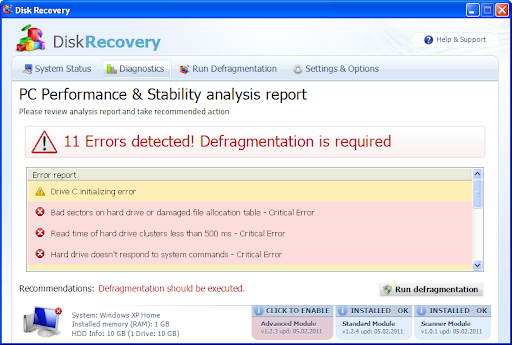 If your PC is infected with Windows Processes Organizer use MBAM to remove the infection. WinScan is a fake Defragmenter tool (rogue) from the same family as: FakeHDD (new GUI). 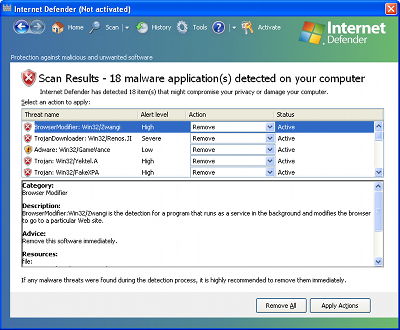 Internet Defender is a fake security application (rogue) from the same family as: Security Defender, Antimalware Defender. It displays fake infections to push users into buying a license. 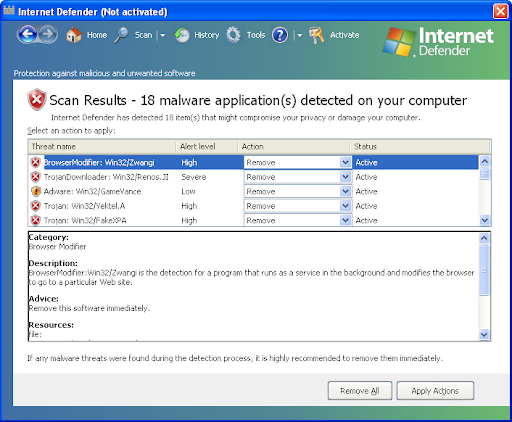 If your PC is infected with Internet Defender use MBAM to remove the infection. 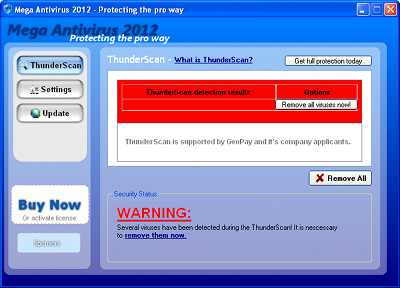 Mega Antivirus 2012 is a fake security application. It displays fake infections to push users into buying a license. 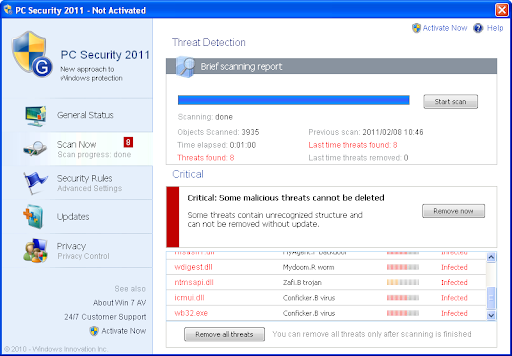 If your PC is infected with Mega Antivirus 2012 use MBAM to remove the infection. Windows Express Settings is a fake security application from the same family as: Windows Optimal Tool, Windows Safety Guarantee, Windows AV Software, Windows Express Help, Windows User Satellite, Windows Problems Solution, Windows Optimal Settings, Windows Optimal Solution, Windows Care Tool, Windows Wise Protection, Windows Software Guard, Windows Software Protection, Windows Safety Protection, Windows Problems Protector, Windows Problems Remover, Windows Health Center, Windows Shield Center, Windows Antispyware Solution, Windows Risk Eliminator, Windows Universal Tool, Windows Utility Tool, Windows Security & Control, Windows Optimization & Security, Windows System Optimizator, Windows Optimization Center, Privacy Corrector, Privacy Guard 2010. This rogue displays fake warning messages pushing users to buy a license. If your PC is infected with Windows Express Settings use MBAM to remove the infection. Windows Optimal Tool is a fake security application from the same family as: Windows Safety Guarantee, Windows AV Software, Windows Express Help, Windows User Satellite, Windows Problems Solution, Windows Optimal Settings, Windows Optimal Solution, Windows Care Tool, Windows Wise Protection, Windows Software Guard, Windows Software Protection, Windows Safety Protection, Windows Problems Protector, Windows Problems Remover, Windows Health Center, Windows Shield Center, Windows Antispyware Solution, Windows Risk Eliminator, Windows Universal Tool, Windows Utility Tool, Windows Security & Control, Windows Optimization & Security, Windows System Optimizator, Windows Optimization Center, Privacy Corrector, Privacy Guard 2010. This rogue displays fake warning messages pushing users to buy a license. If your PC is infected with Windows Optimal Tool use MBAM to remove the infection. If your PC is infected with Internet Security Essentials use MBAM to remove the infection. Windows Safety Guarantee is a fake security application from the same family as: Windows AV Software, Windows Express Help, Windows User Satellite, Windows Problems Solution, Windows Optimal Settings, Windows Optimal Solution, Windows Care Tool, Windows Wise Protection, Windows Software Guard, Windows Software Protection, Windows Safety Protection, Windows Problems Protector, Windows Problems Remover, Windows Health Center, Windows Shield Center, Windows Antispyware Solution, Windows Risk Eliminator, Windows Universal Tool, Windows Utility Tool, Windows Security & Control, Windows Optimization & Security, Windows System Optimizator, Windows Optimization Center, Privacy Corrector, Privacy Guard 2010. This rogue displays fake warning messages pushing users to buy a license. If your PC is infected with Windows Safety Guarantee use MBAM to remove the infection. Windows AV Software is a fake security application from the same family as: Windows Express Help, Windows User Satellite, Windows Problems Solution, Windows Optimal Settings, Windows Optimal Solution, Windows Care Tool, Windows Wise Protection, Windows Software Guard, Windows Software Protection, Windows Safety Protection, Windows Problems Protector, Windows Problems Remover, Windows Health Center, Windows Shield Center, Windows Antispyware Solution, Windows Risk Eliminator, Windows Universal Tool, Windows Utility Tool, Windows Security & Control, Windows Optimization & Security, Windows System Optimizator, Windows Optimization Center, Privacy Corrector, Privacy Guard 2010. This rogue displays fake warning messages pushing users to buy a license. If your PC is infected with Windows AV Software use MBAM to remove the infection. A new version of the multi-rogue scareware has been released. 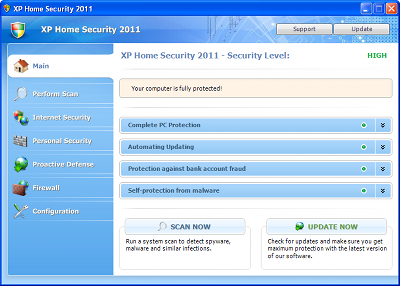 This malware is looking for the OS version (XP, Vista, Seven) and changes its name and skin: XP Anti-Spyware, XP Home Security 2011, XP Anti-Virus 2011, XP Security 2011 (...). It belongs to the Braviax family. As usual it displays fake warning messages to push users into buying a license. Windows Express Help is a fake security application from the same family as: Windows User Satellite, Windows Problems Solution, Windows Optimal Settings, Windows Optimal Solution, Windows Care Tool, Windows Wise Protection, Windows Software Guard, Windows Software Protection, Windows Safety Protection, Windows Problems Protector, Windows Problems Remover, Windows Health Center, Windows Shield Center, Windows Antispyware Solution, Windows Risk Eliminator, Windows Universal Tool, Windows Utility Tool, Windows Security & Control, Windows Optimization & Security, Windows System Optimizator, Windows Optimization Center, Privacy Corrector, Privacy Guard 2010. This rogue displays fake warning messages pushing users to buy a license. If your PC is infected with Windows Express Help use MBAM to remove the infection. Windows User Satellite is a fake security application from the same family as: Windows Problems Solution, Windows Optimal Settings, Windows Optimal Solution, Windows Care Tool, Windows Wise Protection, Windows Software Guard, Windows Software Protection, Windows Safety Protection, Windows Problems Protector, Windows Problems Remover, Windows Health Center, Windows Shield Center, Windows Antispyware Solution, Windows Risk Eliminator, Windows Universal Tool, Windows Utility Tool, Windows Security & Control, Windows Optimization & Security, Windows System Optimizator, Windows Optimization Center, Privacy Corrector, Privacy Guard 2010. This rogue displays fake warning messages pushing users to buy a license. If your PC is infected with Windows User Satellite use MBAM to remove the infection. Windows Problems Solution is a fake security application from the same family as: Windows Optimal Settings, Windows Optimal Solution, Windows Care Tool, Windows Wise Protection, Windows Software Guard, Windows Software Protection, Windows Safety Protection, Windows Problems Protector, Windows Problems Remover, Windows Health Center, Windows Shield Center, Windows Antispyware Solution, Windows Risk Eliminator, Windows Universal Tool, Windows Utility Tool, Windows Security & Control, Windows Optimization & Security, Windows System Optimizator, Windows Optimization Center, Privacy Corrector, Privacy Guard 2010. This rogue displays fake warning messages pushing users to buy a license. If your PC is infected with Windows Problems Solution use MBAM to remove the infection. Windows Optimal Settings is a fake security application from the same family as: Windows Optimal Solution, Windows Care Tool, Windows Wise Protection, Windows Software Guard, Windows Software Protection, Windows Safety Protection, Windows Problems Protector, Windows Problems Remover, Windows Health Center, Windows Shield Center, Windows Antispyware Solution, Windows Risk Eliminator, Windows Universal Tool, Windows Utility Tool, Windows Security & Control, Windows Optimization & Security, Windows System Optimizator, Windows Optimization Center, Privacy Corrector, Privacy Guard 2010. This rogue displays fake warning messages pushing users to buy a license. If your PC is infected with Windows Optimal Settings use MBAM to remove the infection. 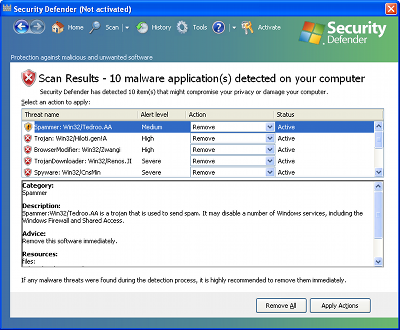 Security Defender is a fake security application (rogue) from the same family as: Antimalware Defender. It displays fake infections to push users into buying a license. If your PC is infected with Security Defender use MBAM to remove the infection. Windows Optimal Solution is a fake security application from the same family as: Windows Care Tool, Windows Wise Protection, Windows Software Guard, Windows Software Protection, Windows Safety Protection, Windows Problems Protector, Windows Problems Remover, Windows Health Center, Windows Shield Center, Windows Antispyware Solution, Windows Risk Eliminator, Windows Universal Tool, Windows Utility Tool, Windows Security & Control, Windows Optimization & Security, Windows System Optimizator, Windows Optimization Center, Privacy Corrector, Privacy Guard 2010. This rogue displays fake warning messages pushing users to buy a license. 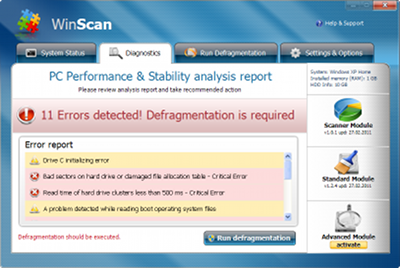 If your PC is infected with Windows Optimal Solution use MBAM to remove the infection. Windows Care Tool is a fake security application from the same family as: Windows Wise Protection, Windows Software Guard, Windows Software Protection, Windows Safety Protection, Windows Problems Protector, Windows Problems Remover, Windows Health Center, Windows Shield Center, Windows Antispyware Solution, Windows Risk Eliminator, Windows Universal Tool, Windows Utility Tool, Windows Security & Control, Windows Optimization & Security, Windows System Optimizator, Windows Optimization Center, Privacy Corrector, Privacy Guard 2010. This rogue displays fake warning messages pushing users to buy a license. If your PC is infected with Windows Care Tool use MBAM to remove the infection. Windows Wise Protection is a fake security application from the same family as: Windows Software Guard, Windows Software Protection, Windows Safety Protection, Windows Problems Protector, Windows Problems Remover, Windows Health Center, Windows Shield Center, Windows Antispyware Solution, Windows Risk Eliminator, Windows Universal Tool, Windows Utility Tool, Windows Security & Control, Windows Optimization & Security, Windows System Optimizator, Windows Optimization Center, Privacy Corrector, Privacy Guard 2010. This rogue displays fake warning messages pushing users to buy a license. If your PC is infected with Windows Wise Protection use MBAM to remove the infection. PC Security 2011 is a fake Antivirus (rogue). It detects and display fake infections to scare users pushing them into buying a license. Windows Software Guard is a fake security application from the same family as: Windows Software Protection, Windows Safety Protection, Windows Problems Protector, Windows Problems Remover, Windows Health Center, Windows Shield Center, Windows Antispyware Solution, Windows Risk Eliminator, Windows Universal Tool, Windows Utility Tool, Windows Security & Control, Windows Optimization & Security, Windows System Optimizator, Windows Optimization Center, Privacy Corrector, Privacy Guard 2010. This rogue displays fake warning messages pushing users to buy a license. Windows Safety Protection is a fake security application from the same family as: Windows Problems Protector, Windows Problems Remover, Windows Health Center, Windows Shield Center, Windows Antispyware Solution, Windows Risk Eliminator, Windows Universal Tool, Windows Utility Tool, Windows Security & Control, Windows Optimization & Security, Windows System Optimizator, Windows Optimization Center, Privacy Corrector, Privacy Guard 2010. This rogue displays fake warning messages pushing users to buy a license. 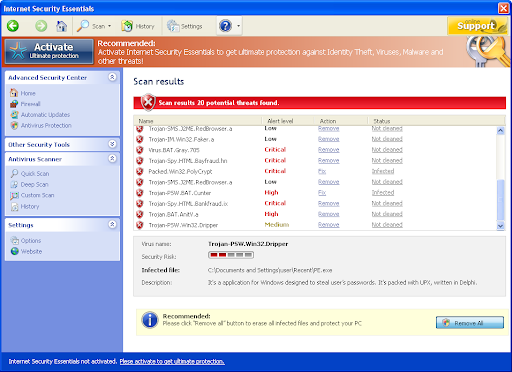 If your PC is infected with Windows Safety Protection use MBAM to remove the infection. Disk Recovery displays a lot of disturbing disks errors messages, prevent softwares execution pushing users to purchase a license. AntiVirus System 2011 is a fake security software (rogue). It is from the same family as: Security Inspector 2010, AntiVirus Studio 2010, Desktop Security 2010, Total PC Defender 2010, Desktop Defender 2010, Contraviro, UnVirex. 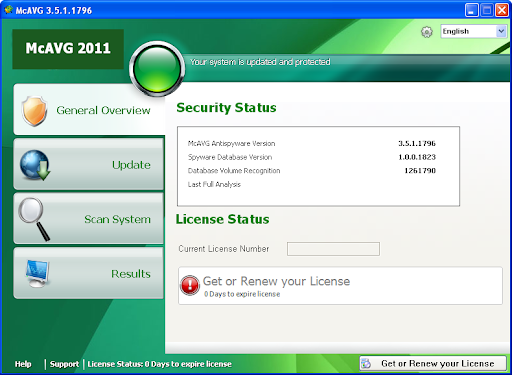 AntiVirus System 2011 displays a lot of disturbing warning messages pushing users to purchase a license. If your PC is infected with AntiVirus System 2011, use MBAM to remove the infection. WinDisk displays a lot of disturbing disks errors messages, prevent softwares execution pushing users to purchase a license. Windows Problems Protector is a fake security application from the same family as: Windows Problems Remover, Windows Health Center, Windows Shield Center, Windows Antispyware Solution, Windows Risk Eliminator, Windows Universal Tool, Windows Utility Tool, Windows Security & Control, Windows Optimization & Security, Windows System Optimizator, Windows Optimization Center, Privacy Corrector, Privacy Guard 2010. This rogue displays fake warning messages pushing users to buy a license. If your PC is infected with Windows Problems Protector use MBAM to remove the infection. Windows Problems Remover is a fake security application from the same family as: Windows Health Center, Windows Shield Center, Windows Antispyware Solution, Windows Risk Eliminator, Windows Universal Tool, Windows Utility Tool, Windows Security & Control, Windows Optimization & Security, Windows System Optimizator, Windows Optimization Center, Privacy Corrector, Privacy Guard 2010. This rogue displays fake warning messages pushing users to buy a license. If your PC is infected with Windows Problems Remover use MBAM to remove the infection. If your PC is infected with McAVG use MBAM to remove the infection.